Marshmallow has gained much appraisal from the gadget lovers across the world. Now they are ready with an update for the same. The update is planned for Nexus and Android One gadgets in the initial stage. Google has already released factory images of Android 6.0.1 Marshmallow for Nexus gadgets. If you can’t wait for the update, then you can manually download and install the same on your devices. To download and manually install the update involves certain risks. You could lose several data that you have saved on your device. Also the installation process is quite complicated. So if you are new to this, then is advisable that you should eventually wait for automatic update. Initially the update is available for Nexus devices like Google Nexus 5X, Google Nexus 5, Google Nexus 6P, Google Nexus 6, Google Nexus Player, Google Nexus 9 and Google Nexus 7 2013. In this article I would like to explain the steps that you have to follow to download and install the update manually. You have to download and install the updated Android Studio Preview on your system or desktop. This will automatically install ADB and Fastboot programmes that can be opened with the help of command terminal on your desktop. Then add the SDK Folder to the PATH by following the below given steps. Right Click on My Computer icon and from the dialog box select Properties. Now from the options tap on Advanced System Settings. Now select System Properties>> Advanced>> Environment Variables. Now you will see a dialog box and from that select PATH. Now you have to tap on Edit. Now you have to enter the name of the directory in which you have installed the SDK. You have to be cautious about one thing that each entry is separated with the help of semi-colon. Now you have to enable USB debugging for your device. This can be done by going to Settings>> About Phone>> Software Information.Now you have to click on Build Number for seven times. Get into Settings>> Developer Options. Now tick the checkbox of USB Debugging. Now you have to download the suitable Factory Image for your device. Now copy the same to your desktop. This will be in the form of a tar Now you have to extract the file again. Connect your device to your desktop with the help of USB cable. Switch On your device in Fastboot Mode. The easiest way to run Fastboot Mode is to follow certain key combinations. For most of the Nexus devices this must be Volume Up, Volume Down and Power Buttons. This could be different for certain devices in Nexus series. You can also get into Fastboot Mode with the help of ADB tool also. This can be done by going to the Command Terminal when the device is powered on and execute, adb reboot bootloader, command. You can also unlock bootloader of your device with the help of your desktop. This can be done by executing, fastboot oem unlock, command. This can be done by following the below given steps. Access a command terminal and go into the unzipped system image directory. Now execute flash-all.bat command, which is a portion of unzipped image file. This will install the required bootloader, baseband firmaware and Operating System. Inorder to execute this, you have to add the folder where you have saved the ADB and Fastboot, to the system path as said in Step 2 of the above. After completing this, Google will ask you to lock down bootloader due to security reasons. This can be done by executing the fastboot oem lock, command. 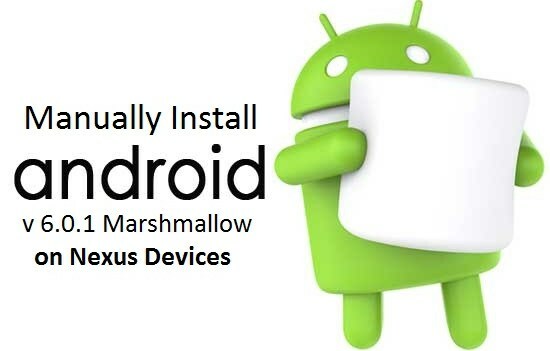 By following the above given steps, you can ultimately install the Android 6.0.1 Marshmallow for your Nexus gadget. I would recommend that if you are experienced with installing the factory images then you can follow the above steps, otherwise this could end up in losing your credentials from your device.